PRICES ARE ACTUALIZED BY THE RUBLE COURSE on May 24, 2015 (0.45 CPC). PRICES MAY CHANGE. REFINE AT THE BOOKING. The sports complex "On the Squadron" was opened in 2012 and is a modern and comfortable place for recreation of the guests of the resort town of Evpatoria. 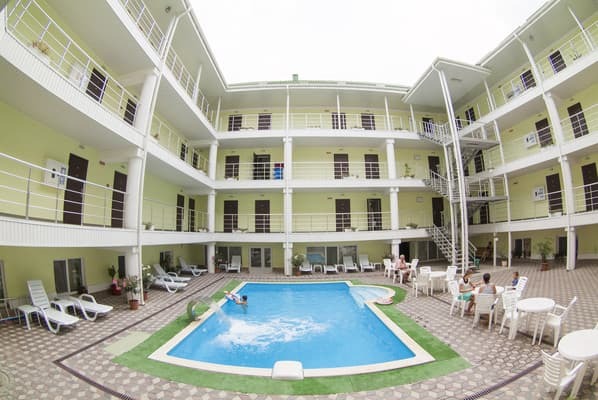 The hotel is located 150 meters from the city's free beach. The hotel consists of 52 rooms of various categories, designed in a calm European style with elegant furniture and carefully selected elements of decor. All rooms of the hotel are equipped with air conditioning, LCD TVs, refrigerators, hair dryers, high-speed Internet and bathrooms with round-the-clock cold and hot water. 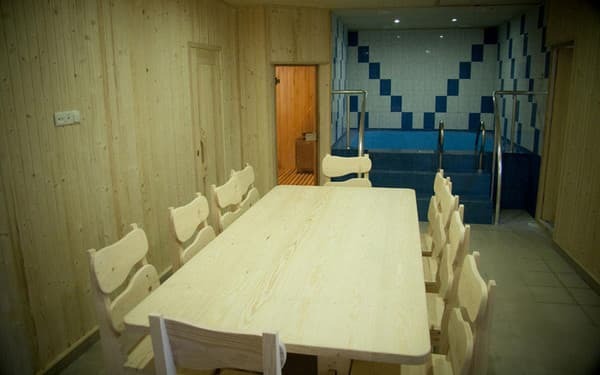 On the territory of the complex there are: swimming pool, sauna, billiard room, gym with lots of power simulators and cardio zone, conference hall for up to 30 people, free parking. 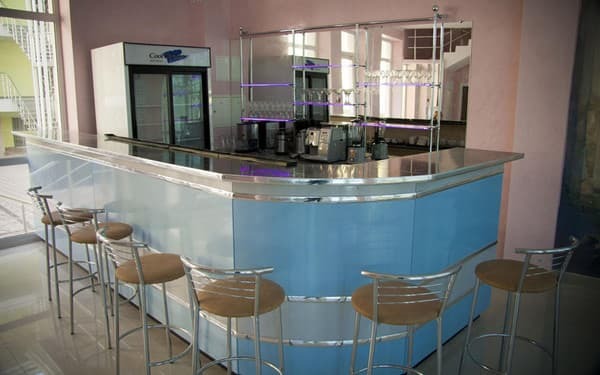 Clients of the hotel "On Squadron" have the opportunity to visit the cafe-bar and the dining room, where you can eat deliciously. Description of the room: Cozy room with everything you need for a comfortable stay for two people. Description of the room: Spacious room, decorated in a classic and modern style. In the room: comfortable double bed, bedside tables, closet, LCD TV with satellite TV, air conditioning, kettle, iron, hair dryer. Description of the room: Room with all amenities, designed for three people. Description of the room: The room is designed to accommodate 4 people, is equipped with everything necessary for a comfortable stay. Description of the room: Exquisite interior of the rooms of this category creates a cozy and romantic atmosphere. The room consists of two rooms: a living room and a bedroom with comfortable furniture. Living room: dining table, sofa, cupboard with necessary utensils, refrigerator, LCD TV with satellite TV, air conditioning. 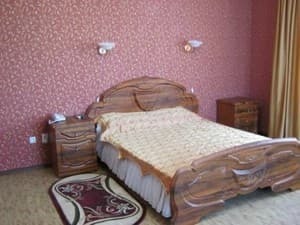 Bedroom: double bed, bedside tables, LCD TV with satellite TV, air conditioning. The room has a balcony. For full comfort, the rooms are equipped with private bathrooms. Description of the room: Studio Suite - spacious comfortable one-room studio apartment. The room is located on the 3rd floor of the complex. The refined interior successfully combines comfort and coziness. The room is furnished with modern comfortable furniture: double bed, corner sofa, mini-kitchen, bar counter, refrigerator, LCD TV with satellite TV, air conditioning. The bathroom is equipped with a shower cabin, with round-the-clock hot and cold water. The area of ​​the room is 30 square meters. m. Studio Suite is perfect for honeymooners. Accommodation of children from any age. Up to 6 years, children without a bed are accommodated free of charge. Additional place is paid 50% of the cost of the main place. 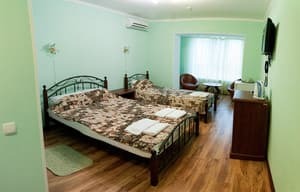 The hotel is located in the resort area of ​​Evpatoria, 150 meters from Simferopolskaya Street. From Simferopol to Evpatoria - 66 kilometers along the Evpatoria highway. The distance from the hotel to the railway station is 3 km; travel by bus number 1 or tram number 1. Transfer is possible.